With Scotland under our belts - literally... 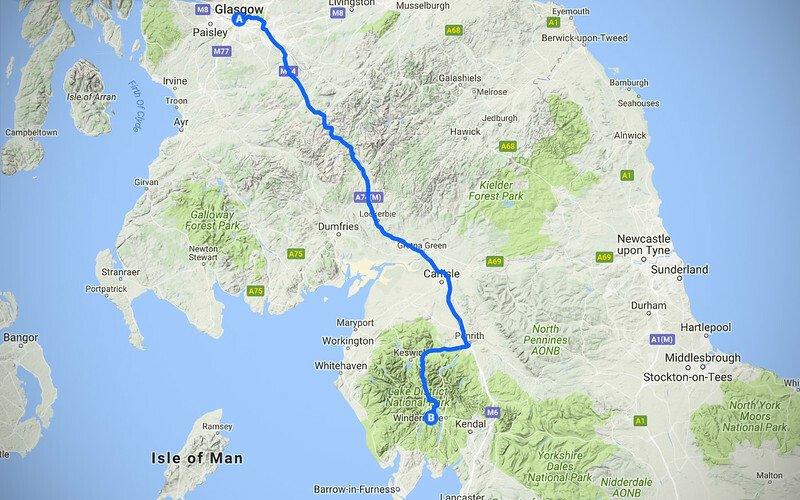 I'm carrying an extra 15lbs worth of haggis and ale around my waistline - we are passing through the Lake District on our way back south through England. This is supposed to be one of the most scenic places in the country. We've been listening to a lot of Ed Sheeran lately. "Castle On The Hill" is being played non-stop everywhere. Since we are in the UK, I did some Googling - the castle in the song is Framlingham Castle. We passed by that area a few weeks ago when we dropped in on the Lavender farm in Norfolk. Haha, so topical! The sky is sprinkling water on our helmets, which is not unusual for the UK. I think about the last couple of weeks we have spent in Scotland and how unusual it was not to have rain every day! Especially for us. We really lucked out! But now it seems that it's back to business as usual with the wet weather. After a couple of hours of slabbing it on the main M6 roadway, we exit at Penrith. 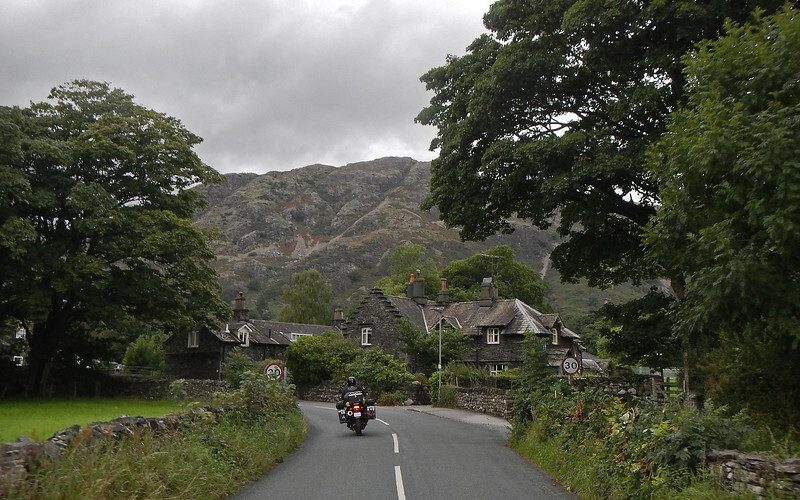 There are quite a few cars accompanying us as we dive wheel-first into the Lake District. First order of business is to find a place to sleep. Neda's scoped out a couple of campsites on the map and we're routing straight there to set up our tent. 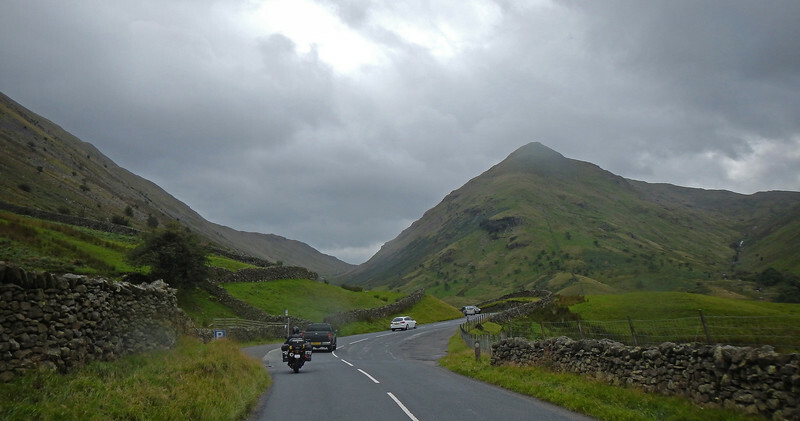 Kirkstone Pass is the highest pass in the Lake District. 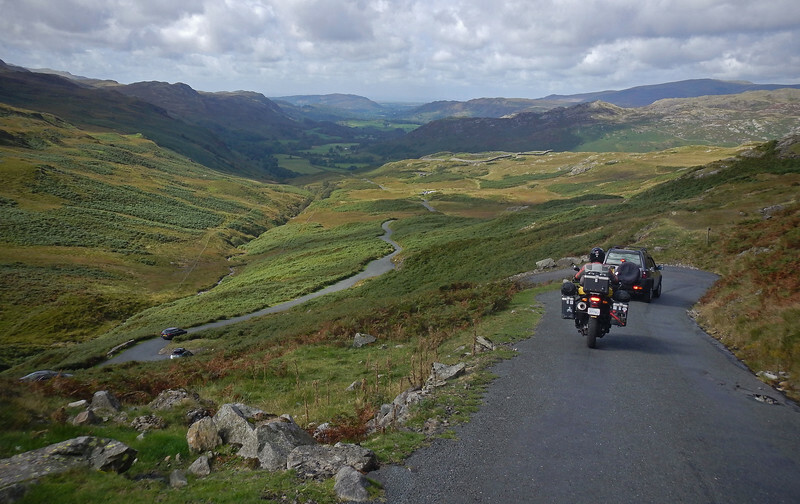 Low stone walls line the roadway as we slowly crawl up and down the pass, hampered by heavy traffic. 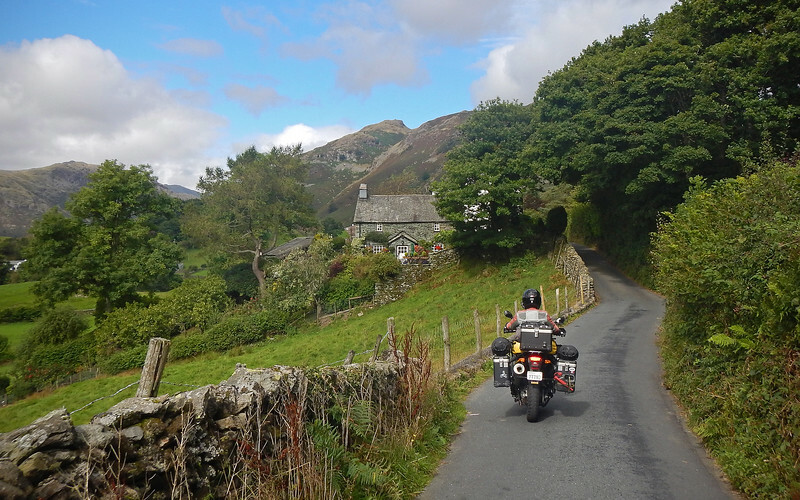 And then we hit our first major town in the Lake District. We crept through traffic in the light drizzle. 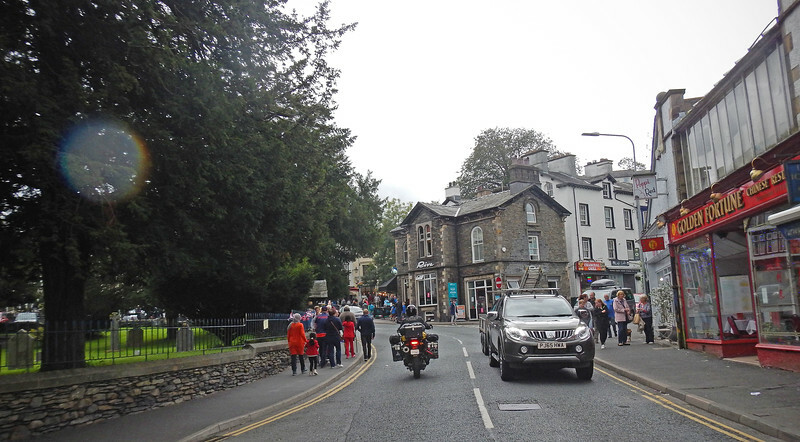 The holiday crowd around us seemed oblivious to the damp weather and seemed to be enjoying themselves, ducking in and out of the thick mass of shops and restaurants that line the town's streets. They must be locals. Oh dog, you look so warm and dry in front of us! So jelly! We're on our way. 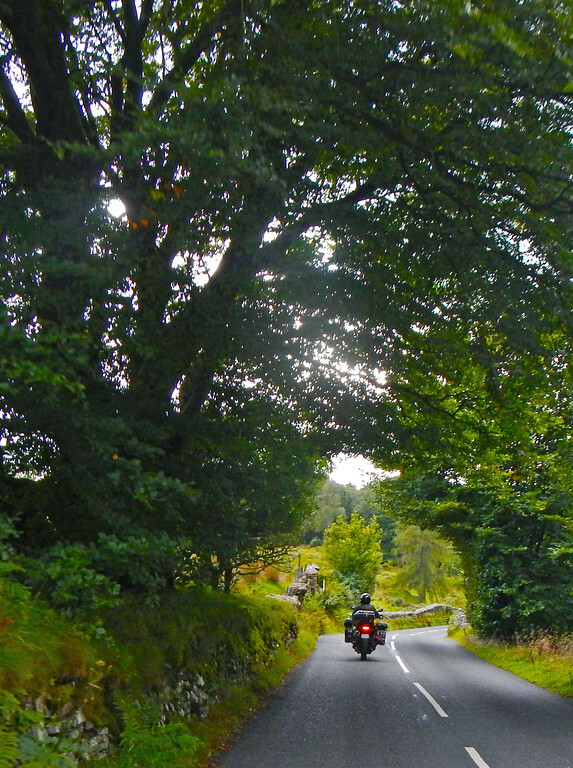 Riding at 30 down these country lanes. 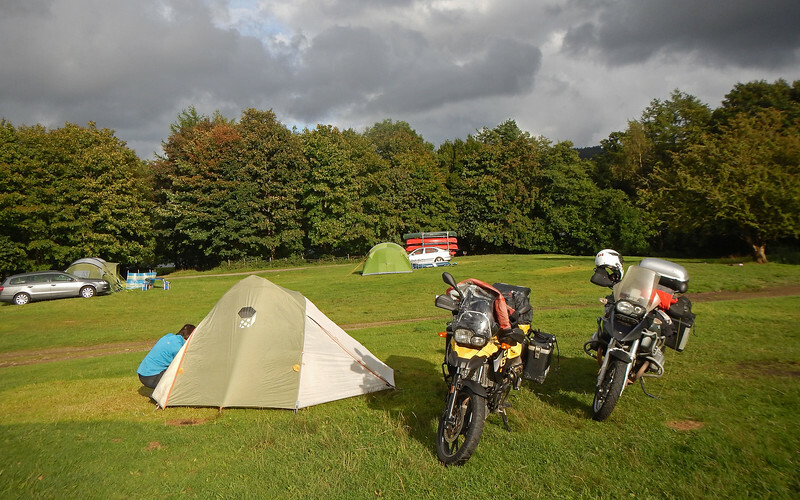 We arrive at the campsite and Neda gets off the bike to grab us a site. She returns shortly with a forlorn look on her face. "No space. All booked up." Oh no! At least the rain has temporarily let up as we hop back on the bikes to head to the next campsite on Neda's list. I'm so thankful she's done all this research! Fifteen minutes later we're knocking on the door of another campsite. But once again, no vacancy! Neda informs me, "Apparently we're here on the busiest weekend of high season. The last summer weekend before kids go back to school..."
What a change from Scotland. Up in the Highlands, campsites are all empty and about to close because the season is winding down. But just a few hours south, we're unable to find a place to sleep. Neda comes out of the office with a big smile and a thumbs up. Yay, we have somewhere to sleep tonight! 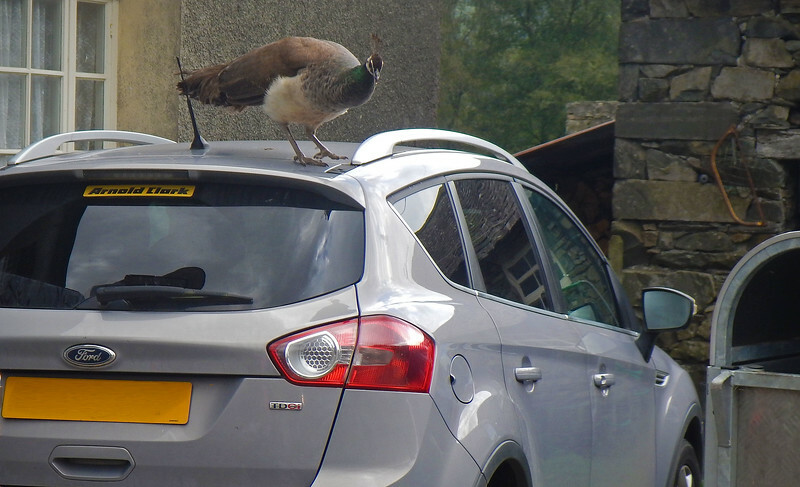 The peacock is indeed a bird of good omen. The campground is crowded! Our tires squish the wet grass as we ride around looking for a clear spot to set up camp. The sun is peeking out from behind rain clouds, which gives us a window of dry weather to pitch our tent. Kids everywhere emerge from campers and tents to savour every last bit of dry weather before they have to go back to school next week. This is the way vacationing is done in the UK! 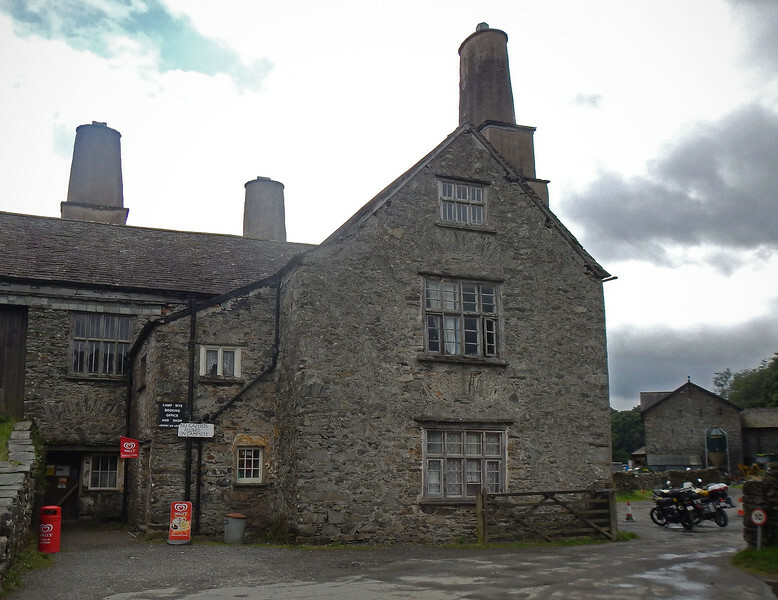 I know this small window of dry weather will be short, so as soon as we get the tent up, we walk into the tiny hamlet of Coniston to find a warm and dry place to sit down, grab a cold pint of some local Cumbrian ale and some Internet. At least the weather looks good tomorrow. And it is! 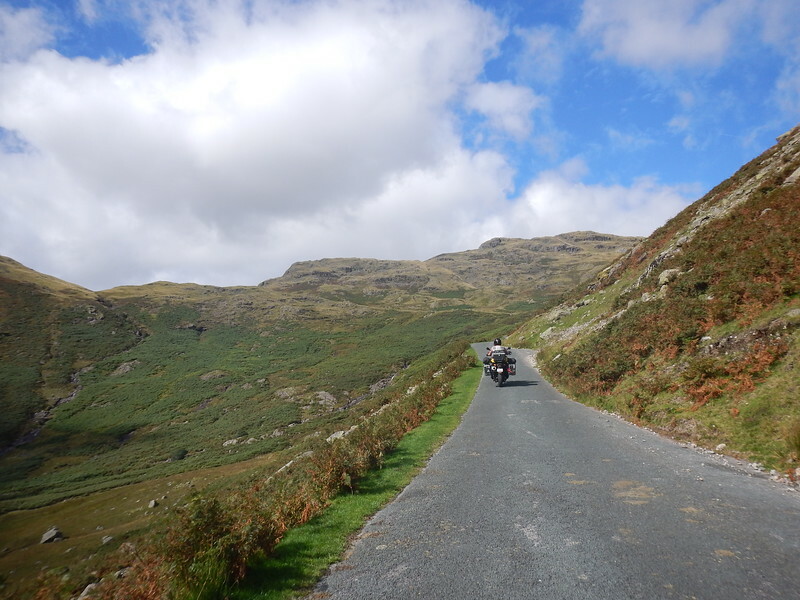 We head out into the sunshine of the Lake District the next morning. But only one of them is actually called a "lake". 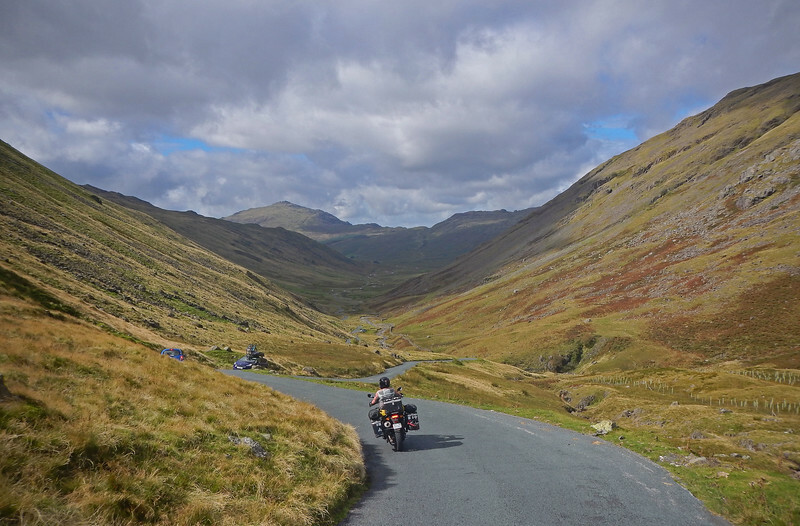 The Brits have other names for these, like meres, tarns and waters. That lake we crossed yesterday wasn't Lake Windermere, it's just Windermere. Very pretty here. Neda says it reminds her of a Thomas Kinkade painting. I have to Google who Thomas Kinkade is. Nice! I can see why this is such a popular place for hiking and camping. But that's not the reason we are here. 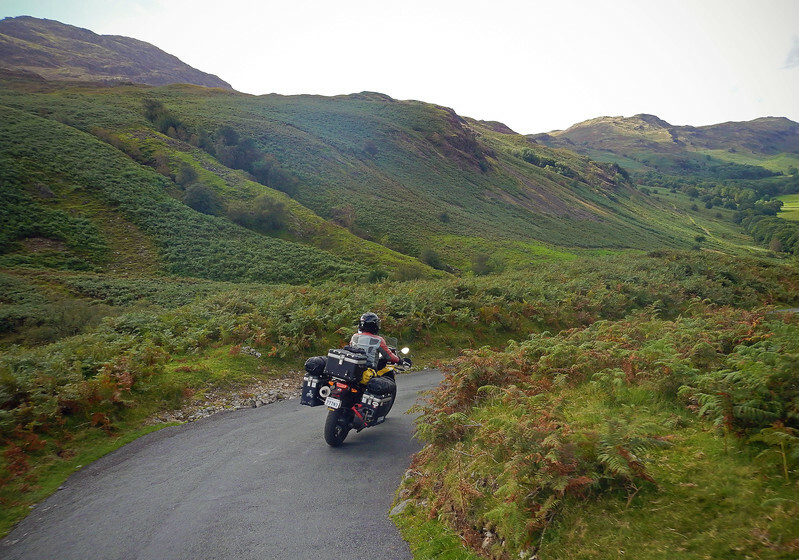 We're motorcyclists and we like riding roads. 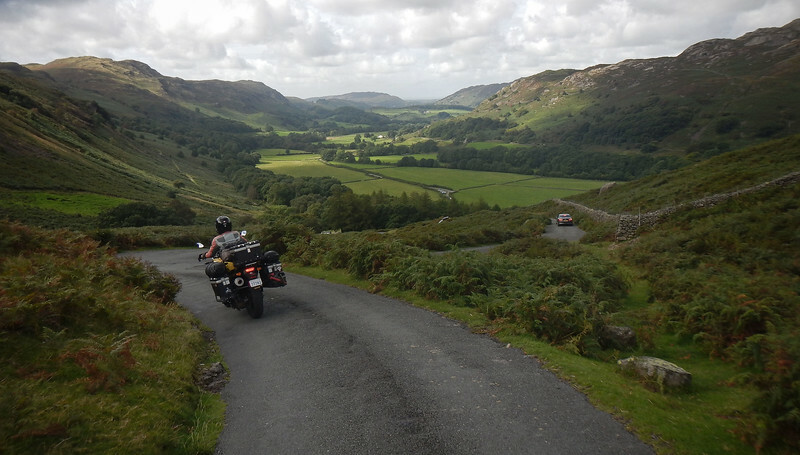 The weather is cooperating beautifully with us as we twist and wind our way around the Duddon Valley. There's still a little bit of the holiday traffic on the roads, but everyone is polite and pulls over to let us pass at the next pullover. 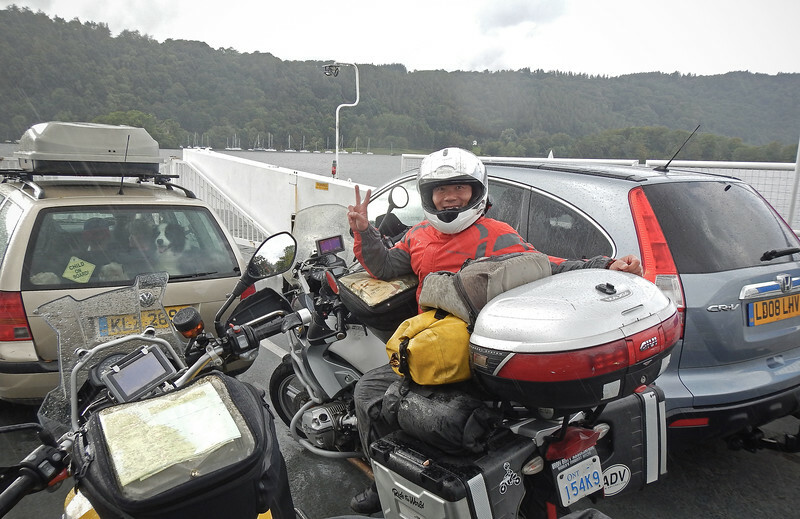 We get held up at a series of hairpin bends. No room for the cars ahead of us to pullover! 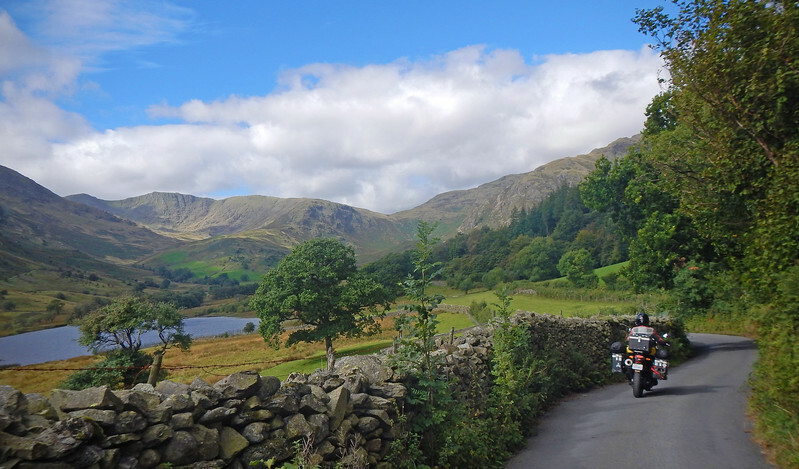 While nowhere near as scenic as the Scottish Highlands, the Lake District does offer up some great views without having to travel the distance to the northern-most reaches of the island.